MHG challenges his readers occasionally with math problems. This one should be easy. In this picture from my Stack and a Story post, how much do I have? The blue chips are $2 and the white chips are $1. You should be able to give an exact amount, even with this limited information. *Well, maybe just an autographed picture of the stack. It's all I have left anyway. $1,043 if you count the $8 blind in the bacjground...$1,035 if not. Got it figured out, and went to comment with my winning answer, only to see that CK beat me to the punch. Damn Asians and their mad math skillz. CK's answer is the correct one. Ding ding ding! We have a winner. Well done CK. It's true I didn't specify whether or not you should include my late position limp (seen just to the left of the stack), but I won't count that against you. FWIW - I had pocket 6s and missed. I prolly should have raised, but I was too busy taking the picture. Sorry, I subscribe to California-nomics, where how much you have is how much you can borrow. 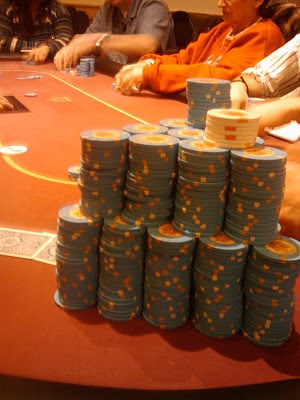 Can I get an autographed pic of The Wife instead of an autographed pic of The Stack? I'm Registered - Why Aren't You?